Kelli day actually equLled to Kelli weekend. Or should I say long weekend as I took Friday off from work to ... Well, to have Kelli Day. 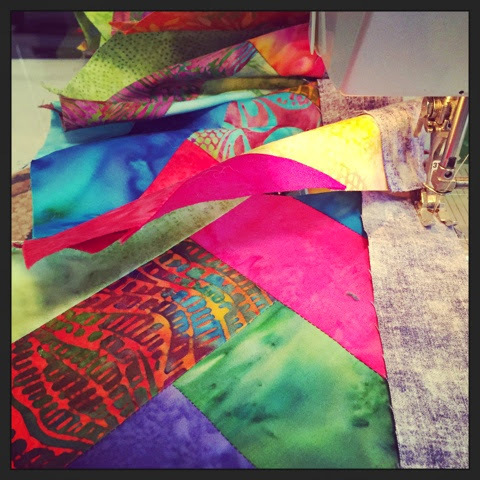 Here is a snap shot of a quilt I am working on for a gift. I'm excited tone setting the braid strips and though you can't see it, the purple strips are really doing the trick to soften the yellows & oranges. Stay tuned for more pics of this finished work. Kelli day also included project organization. 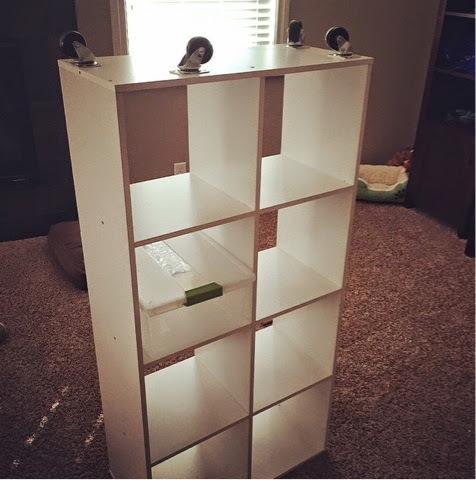 Drew helped me put together these two shelves for my sewing room. He did the heavy lifting, aka read the instructions to make sure I didn't screw up. Don't worry, we didn't put the wheels on as they are displayed. Next success, I dropped off 4 paintings to Smiling Turtle Art Spot. 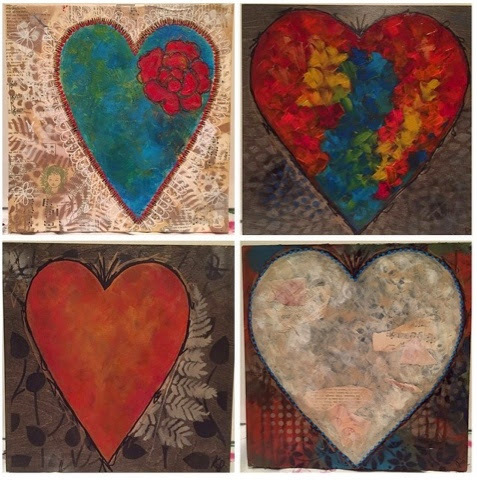 These are 12 x 12 acrylic / mixed media paintings from my heart series. These pictures really don't do the details of the paintings justice. This is my shameless plug to tell you that you should stop by the spot to see them in person. Last but not least - I finished this custom painting called "Vicki's Bike." 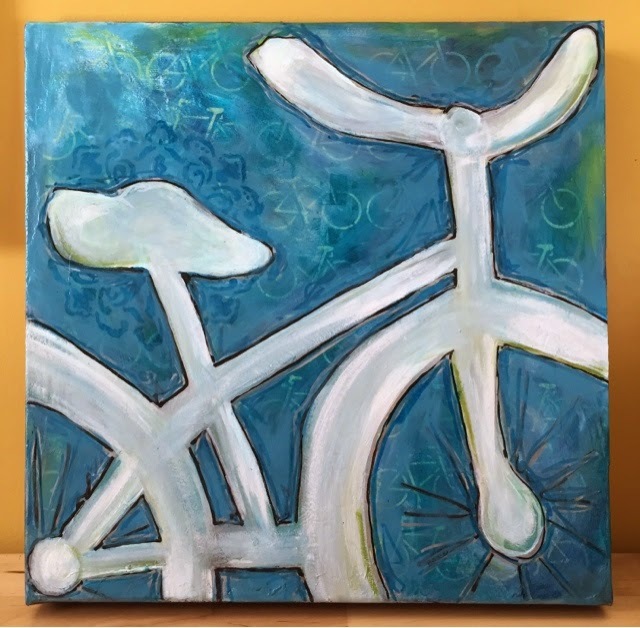 This is a 12 x 12 acrylic painting and is the third bicycle painting in this series. I really like working on these, so I started one in a color pallet for Wear Yellow Nebraska. If it turns out well, I will make prints of it to help fundraise for our cab ride program. 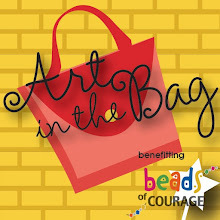 Art for good. 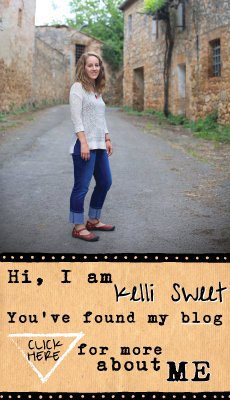 #kelliweekend is now coming to an end - can't wait to keep up the sewing and painting momentum. And, I need to also add some beading to my agenda too.